An extract from Birches Estate, Turton by Jim Francis and Peter Harris, pages 29-35, part of chapter 3. The piece of land on the bank of Bradshaw Brook, now known as the Vale, was part of one of the four separate farms making up the Birches Estate. Although the Bradshaw Township boundary with Turton is nominally Bradshaw Brook, there is, just here, some Bradshaw Township land on the other side of the brook, suggesting that it has changed course over the centuries. 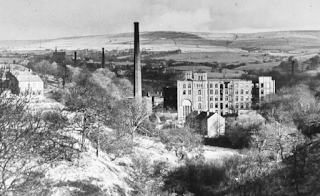 This brings the Vale House area, as well as the section which held Turton Paper Mill, into Bradshaw. This low lying vale includes brookside meadows called Holmes but the main field, called The Hag Pasture, of three acres (Cheshire Measure) overlooks Bradshaw Brook with a cliff-like edge about fifty feet above the brook. As mentioned in the earlier text, the Catholic Land Holding Register of 1717 notes that Viscount Fauconberg, the then owner of the Birches Estates, details Birches Farm as let to Adam Horrocks for the lives of his three sons, James, John and Samuel. The Horrocks’ continued with leases on the Birches farms and in 1780 the first Land Tax Register details John, James, Samuel and William Horrocks as leasing four equally sized holdings within Birches. The first record of Stone Mill is found in a lease of c1788 between Henry Offley Wright Esq (the then owner of Birches Estate) and John Horrocks Snr agreeing on a partition of the land and premises between John Horrocks Snr and his son, John Horrocks Jnr. A portrait of 1803 from the 'Story of Horrocks' published by the company. It would appear there had been an earlier lease by H O Wright to John Horrocks Snr for the whole of this section of land as a sub-lease from the main Birches farms. It seems that John Horrocks Snr had been interested in the area for its stone quarry. The narrow strip of land alongside the brook was called the Holme referring to riverside land or water meadow. The cliff-like appearance of the higher Hag Meadow has been caused by quarrying. Stone from here and other local sources, provided the basis of John Horrocks Snr’s business of stone grinding and polishing. To mechanise the process he built a small works building with the adjacent reservoir to provide power for his process. Apart from the continuing need of building stone there was a specialist need by the local calico printers for stone printing tables. The early method of printing was by pressing on to the cloth, an inked wooden block, usually made of sycamore, with a design carved onto its face. The length of cloth needed to be held flat on a table for a reasonable 'run' so that the blocks could be used to print a continuous design. There were printing shops locally at Know Mill, Turton Mill and nearby Quarlton Vale Printworks who would use such tables until mechanised roller printing was introduced. A fairly late example of these stone printing tables is included in a newspaper report referring to George and John Millington having taken over the business of Spencer, Smith and Fairclough at Quarlton Vale Printworks in 1832. The equipment acquired included 'a short table of 68 inches and two long tables' - the latter would have been of the order of 9ft to 12ft long. As well as stone quarried from the Hag Field, there were other sources for these large slabs at Edgworth (Thomasson Fold) and Entwistle (Round Barn). John Horrocks Snr had set up a mechanised grinding and polishing process, to produce flat tables, using a water-wheel powered from the reservoir behind his works. A nearby weir on Bradshaw Brook enabled him to keep his reservoir well fed. A roadway was built from Birches Lane at the corner of the sharp bend near Eller Grove down to the top end of Stone Mill reservoir. This lane remains as a footpath today. Another roadway led across a ford just below the weir alongside the brook to meet the ancient highway near the packhorse bridge. The partition lease, c1788, agreed with Mr Wright by John Horrocks Snr and Jnr must have been made just after John Jnr had set up his cotton mill adjacent to his father's stone mill. They used a common water supply from the reservoir. John Jnr also built the small terrace of cottages overlooking Bradshaw Brook. John Horrocks Jnr was born in 1768 at Bradshaw Hall Fold growing up with his elder brother Samuel, who was born in 1766. Their father (1745-1816) had married Jane Booth of Edgworth in 1766 and the family returned to Birches soon after the birth of the boys. It was here that John Snr started his stone quarrying business. Young John went to work at Thomas Thomasson's Walleach 'Engine Mill', one of the earliest cotton spinning mills in the area dating from 1782. Thomas Thomasson was a Quaker believer, as was John Horrocks Snr, which may have influenced Mr Thomasson's interest in young John who was helped with schooling until Thomasson's early death. Both John and Samuel Horrocks then went to work with their father but John, after his experience at Thomas Thomasson's Engine Mill, set up his own cotton mill adjacent to his father. He was soon producing yarn which he supplied to local spinners and handloom weavers by packhorse. This venture took him to Preston where increasing demands led to John Horrocks installing additional spinning frames and employing more hands supervised by his brother Samuel. 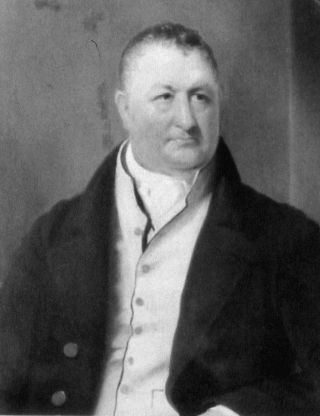 A price dispute with a Mr Watson, his main Preston customer, moved John Horrocks to set up his own business at Preston in 1791 in competition with Watson’s. 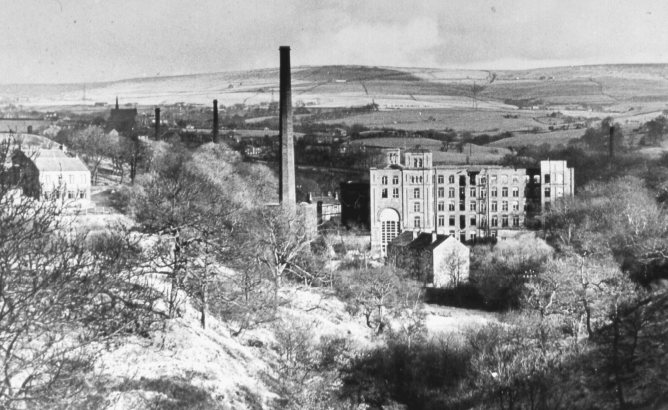 The Bradshaw cotton mill in the Vale continued to produce under the name of John Horrocks but under the management of his brother Samuel. John Horrocks Jnr married Mary Lomax of Edgworth in 1790 and the couple settled in Preston, building Penwortham Hall the following year, to be close to his ever growing enterprise. Samuel had married Alice Duckworth of Edgworth in 1786 and continued to manage the Bradshaw Stone Mill Cotton Works until he also moved to Preston after building his new house 'Lark Hill' in 1796. By this time Samuel had become a partner with his brother John in Horrocks & Co.
With the ever increasing demands for cotton manufacture it is likely that the stone machining business of John Horrocks Snr ceased from the end of the 1790s with the freed space taken up with more carding and spinning capacity. of Lark Hill, Preston, brother of John. Portrait by Lonsdale (Harris Museum & Art Gallery). 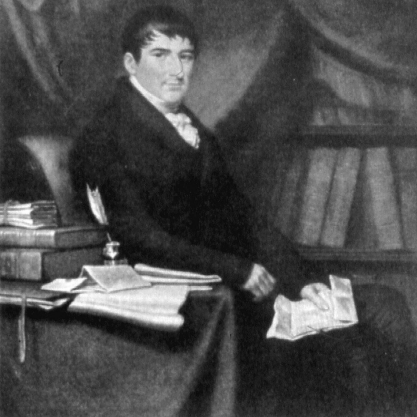 John Horrocks was elected Member of Parliament for Preston in 1802 and was succeeded on his death in 1804 by brother Samuel who held the parliamentary seat until 1826. On John's death, Samuel continued to control Horrocks & Co, which as well as the huge Preston enterprise still included the much smaller operation at Stone Mill. Just after John's death in 1804, it was decided to build a house of distinction in the area for John Horrocks Snr from which he could supervise the Stone Mill cotton manufacture. A lease dated 1807 between Laurence Wright, John Horrocks and others devised to John Horrocks a piece of land of 9,186 sq yds, on the west side of Bradshaw Brook, up to the ancient highway leading from the packhorse bridge to Chapeltown and beyond; this section of land being within the Birches' Estate in the Township of Bradshaw. This lease plan of 1807 shows New House (now known as Vale House) and the lease includes the 'House and Buildings'. These details suggest the house was built some time before 1807. A new road was also to be built across a stream bridge and up to the 'New Road from Edgworth to Bolton'- the newly built Wellington Road completed in 1797. It is interesting to see noted 'the old road to Factory' which ran from the ancient highway along the bank of the brook to Stone Mill - across a ford just below the weir. As well as the handsome Georgian style house were an adjacent barn, stable and coachhouse making a comfortable country gentleman's residence for John Horrocks Snr and his wife, Jane, until his death in 1816 and hers in 1822. On John Horrocks Snr's death the management of the Stone Mill was overseen by Henry Horrocks, grandson of Samuel Horrocks and the brother of John Snr. Henry lived at Vale House after the death of John Horrocks Snr's widow.